Disabled cat .. what to do ?! About 2 years ago, we found him on the street (me and my sister), a little kitty, eyes severly affected. After treatment and eventually operation, he's been blind. At first it was sad news for us, I thought how could he live among all our other cats like that, but he prooved me wrong. He is the most affectionate cat I've ever seen, smart and energetic. But 3 days ago, every thing went worng again for him. We found him paralyzed in the posterior parts. the vet didn't ask for radio or something, didn't provide a lot of information either, he just said we better euthanize him. I think that's easy to say, and easy to do, but easy is not an option for us. I feel we're abondonning him if we do so. I don't know what to do .. Yesterday was his first night in the house, we washed him, put baby diaper on (animal diapers are too expensive, I'm jobless and my sister is still student so financially it's not easy either), but in the morning the mess was all around the room. However, he eats normally, likes it when we play with him as usual. Please help us with any information or physical help you can provide. Which medical options do we have? what should we do medically? Otherwise, how can we take care of him, cleaning, excersing , I don't know ..
@Sana we are so sad to hear this. It sounds like he could have had a stroke or spinal injury. Is he able to walk? These are things he could recover from. Every situation is different. I have had injured birds, cats with different health issues and it often is just trial and error. You will have to try different ways of doing diaper until something works. You could work on exercising his legs, but you really need to know the source of the problem or it could make things worse. I am happy you are giving this little guy a chance. Please let us know how he is doing. @Snuggle_Liza_Tam_Syl Thank you so much for your response. Yes exactly he had a spinal injury. He walks on his front legs. According to the vet, he doesn't have sensitivity (I don't know if the word is correct, sorry) in his back legs. In Tunisia, we don't have IRM, etc for animals, so the vet couldn't say what the exact problem was, but he said that chances for him to be walking again are apparently very weak. He's doing mesotherapy (2 sessions till now). I asked another vet and she said we can wait until he finishes 4 sessions of mesotherapy and see ..
Now he's doing fine. He adores lounging in the sun ^^ I'm doing better with the diaper, but still, bathing him is so hard for him and for us, he doesn't like at all. How often should I change his diaper ? Hi @Sana I am happy to hear he is doing better. You will probably have to just try different things with diaper, but I would think at least 2 or 3 times daily. You don't want him to get sores. I had to wash my Liza some after she got liver cancer. She wasn't happy about it, but she seemed to understand why I was doing it. She got to be very good about doing it. I hope things continue to improve. As long as he is happy and not in pain, he can enjoy sunshine. Hopefully he will regain some strength in his legs. Hugs and purrs from all of us to you and your family. Thank you so much @Snuggle_Liza_Tam_Syl for your support and lovely words. I hope it too. I change his diaper 4 times daily, sometimes 3, that's enough I guess. For the pain, I can't be sure. Animals don't complain as much as humans but sometimes he seems out of patience. Yesterday my sister strated rethinking about euthanazing him.. but that would be heartbreaking. I hope we won't have to get there. All I need is a sign from him to keep fighting. I'm afraid we're putting him into painful journey. We're going back to his vet this afternoon, I have a lot of questions to ask. I hope everything will be okay. I hope your Liza is doing fine too. Hugs and purrs from us to you too, thank you. Hi @Sana You're welcome. I hope the vet is able to give you some encouraging news. Yes. Other animals are much better at adapting than humans. 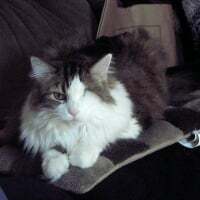 My Snuggle lost an eye to cancer. I was devastated, but she just continued on as normal. I am sure your little guy gets frustrated. Hugs to you for loving him and giving him a chance. I am glad that he is eating. Hopefully all of your love and care will help him get stronger. Sadly, I lost my beautiful Snuggle and Liza several years ago, but both were with me much longer than vets estimated. Hugs and purrs to all of you from all of us. Oh I'm sorry. They're surely both happy in their cats' heaven. Yes. I noticed, for animals, losing an eye is not worth the sadness. They have a remarkable ability to adapt. So today we were going to the vet to know what exactly are his predictions and ask for detailed explanations, otherwise we were really considering euthanazia. As I told you earlier, I was waiting for a sign from my dear Tahou. About an hour before going to the vet, I was sitting on my bed and looking at Tahou lounging in the balcony. Suddenly he gave me my sign.. he tried to get up on his back legs, he couldn't of course but that was the first time I saw him doing that kind of effort. Even the vet seemed more positive today. Till today he insisted on euthanazing him, he's got a negative speech that upsets me. But today he said that Tahou has more tonicity in his legs. Also, he felt the injection's pain in his lower back (He didn't use to feel it). That was the first time the vet said we better wait for some time and see. So yeah here we are, waiting and hoping. This is Miss Rufi looking at Tahou enjoying sunshine. 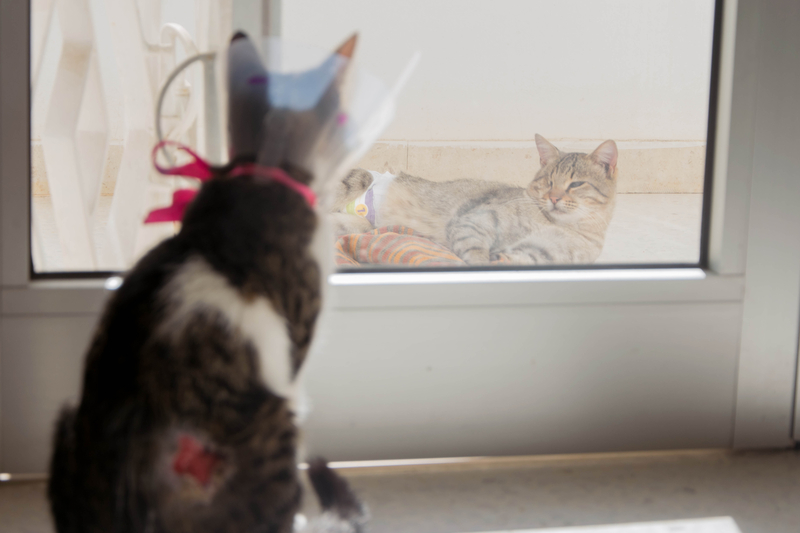 She's jealous, she wanna go outside too but she's got a pretty serious abcess, so untill her wound gets better, she's forbidden from going outside to prevent infection. She went through a lot of pain last days, But thanks god, she's doing a lot better now.